The new McLaren 570S Spider combines the exceptional dynamism and refinement of the 570S Coupé with the extra exhilaration of open-air motoring. Hand-assembled in Woking, England, the 570S Spider is the most attainable McLaren Spider ever and brings supercar attributes such as carbon-fibre construction, a mid-engined layout and extreme performance for the first time to the luxury sports convertible segment. 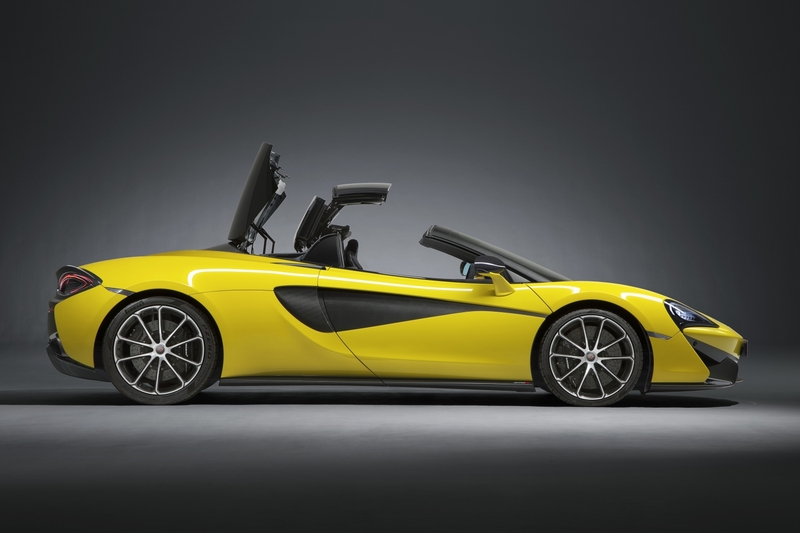 The two-seat, rear-wheel drive 570S Spider is the third bodystyle in McLaren’s Sports Series portfolio, lining up alongside the Coupé and the GT. Compared to the Coupé, the 570S Spider adds a neatly integrated, retractable hardtop that when lowered delivers an even more immersive and exhilarating driving experience. The two-piece roof – which is engineered using technology proven in the McLaren 650S and 675LT Spider models – is constructed of lightweight composite panels and creates a purposeful, sleek appearance whether raised or lowered. Most importantly, there are no performance compromises versus the 570S Coupé, with the Spider maintaining the same electrifying pace, dynamic excellence and impressive refinement. The carbon fibre MonoCell II chassis at the heart of all Sports Series cars does not suffer any reduction in strength or stiffness in convertible guise, or require any additional structural actions. 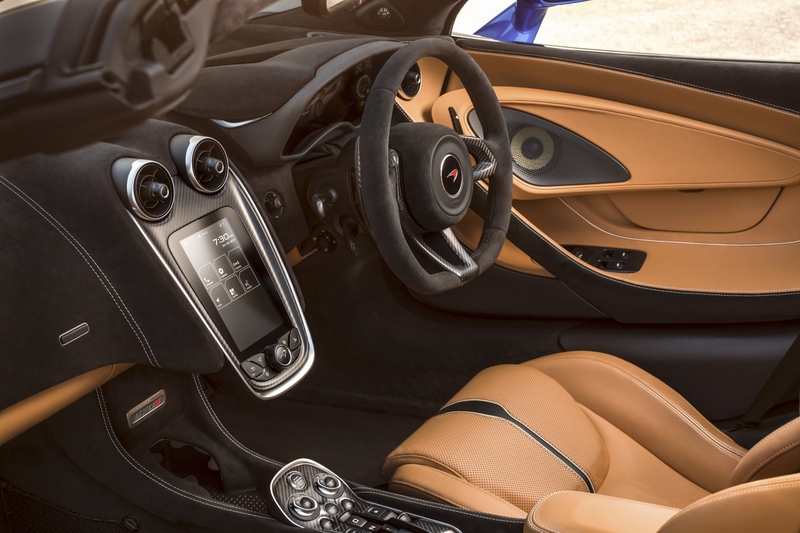 This has allowed McLaren engineers to design and develop the 570S Spider without concerns that are potentially a significant issue with steel or aluminium structures. Electrically operated from the driver’s seat using one simple control, the roof folds effortlessly to stow beneath a beautifully crafted tonneau cover that rises automatically to accommodate the lowered panels and returns to its closed position with the assistance of soft-close technology. The roof can be opened or closed in just 15 seconds, at vehicle speeds of up to 40km/h (25mph). 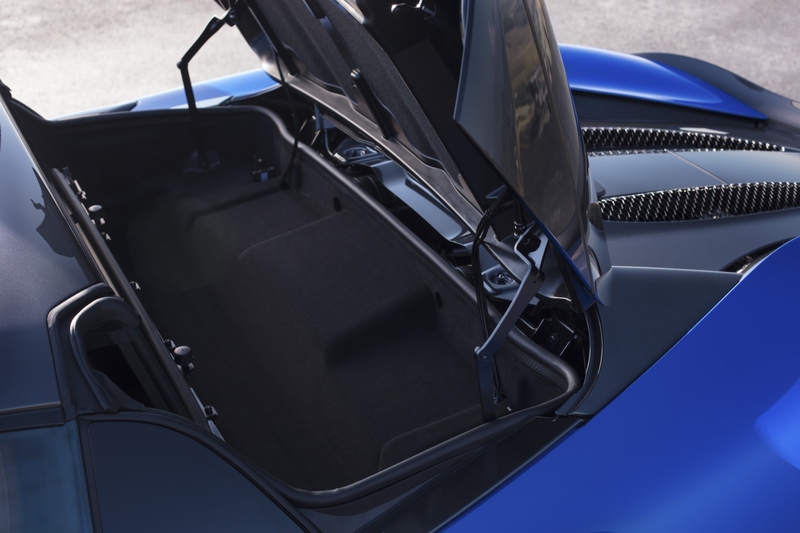 The retractable hardtop is designed to withstand the severest conditions and is significantly more weather- and fade-resistant than fabric, yet with its operating mechanism adds just 46kg to the weight of the Spider; this is the only variance in weight between the new convertible and the 570S Coupé. 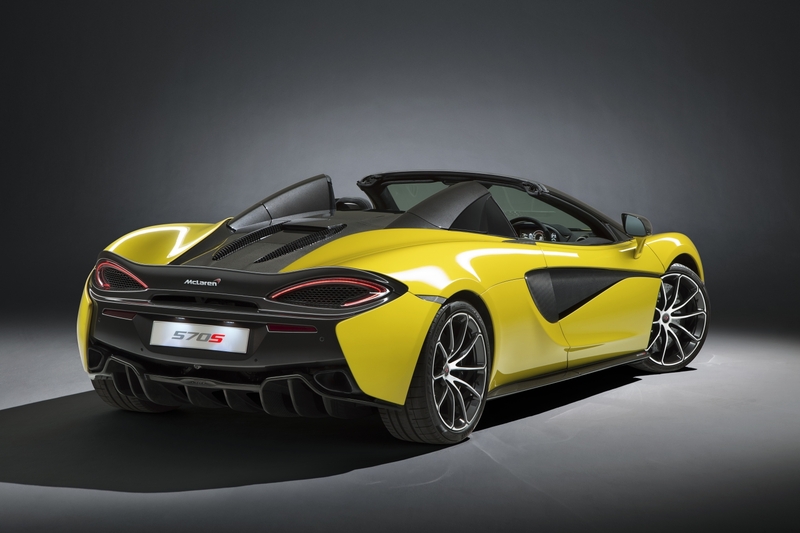 The combination of lightweight carbon fibre construction and an incredibly potent 3.8-litre, twin-turbocharged McLaren V8 engine, means that the new 570S Spider is both more powerful and lighter than comparable convertibles, with an impressive power-to-weight ratio of 419PS-per-tonne (lightest dry weight). Positioned behind the driver, the twin-turbocharged McLaren M838TE engine produces 570PS at 7,500rpm and torque of 600Nm between 5,000rpm and 6,500rpm. In combination with a rapid yet smooth seven-speed seamless-shift gearbox featuring Launch Control technology, the result is a luxury sports convertible with supercar acceleration from standstill to 100km/h (62mph) in 3.2 seconds and to 200km/h (124mph) in just 9.6 seconds. Top speed is 328km/h (204mph) with the roof in place – identical to the 570S Coupé – and even with the roof lowered, the new Spider can reach 315km/h (196mph). Complementing this extreme performance is a stop-start system that contributes to overall efficiency; the 570S Spider returns official fuel economy of 10.7 litres/100km (26.6mpg) in the NEDC combined cycle and CO2 emissions of just 249g/km. 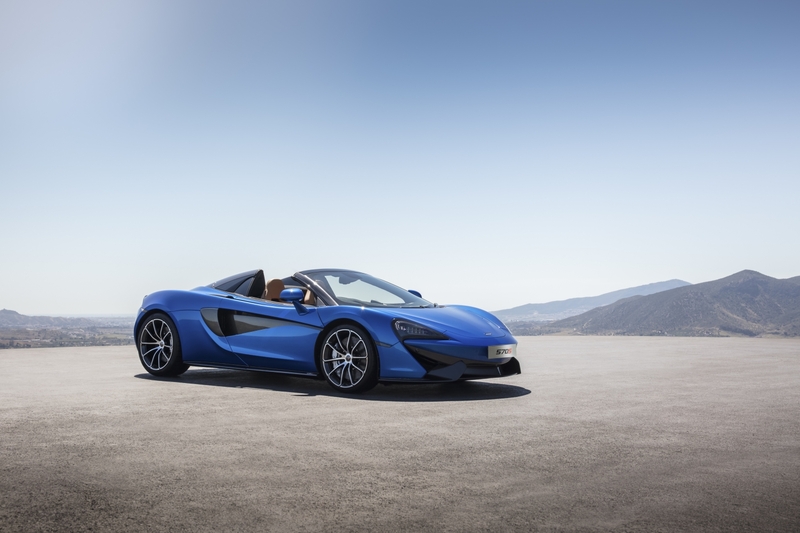 McLaren’s new Spider employs racecar-style, double-wishbone suspension all-round, with steel springs, twin-valve adaptive dampers and anti-roll bars calibrated to the same exacting specification as the 570S Coupé. Body control is exceptional and the overall drive incredibly pure and rewarding, while retaining impressive comfort. Accessing the Active Dynamics Panel adds another level of personal choice, allowing the driver to choose from Normal, Sport or Track modes, for progressively softer or firmer suspension. This versatility ensures that the Spider is as at ease in everyday use as it is on a race track. The breath-taking body design is enhanced by a rear spoiler, finished in Dark Palladium grey (a visible carbon fibre finish is available at additional cost via McLaren Special Operations) and 12mm taller than the rear spoiler of the 570S Coupé. The higher spoiler provides additional downforce to offset the aerodynamic changes resulting from the Spider having a different rear upper body design, ensuring exceptional aerodynamic balance overall that is the equal of the Coupé. Designed around a perfect driving position that puts the driver at the centre of the action, the sophisticated cabin blends exceptional levels of craftsmanship, quality and technology; hand-stitched leather on the seats, door casings, dashboard and centre console sits side-by-side with a 10-inch TFT main instrument cluster and a centrally mounted, 7-inch IRIS touchscreen through which climate control and infotainment functionality are managed. Customers can choose from standard six-way-adjustable or optional eight-way adjustable electric memory seats, with luxurious Nappa leather or performance-oriented Alcantara® trim available at additional cost. Lightweight carbon-fibre-shelled sports seats, the same as those fitted to the McLaren P1™, can also be specified. Three new exterior colours celebrate the Spider’s introduction, with Curacao Blue, Vega Blue and Sicilian Yellow joining the existing Sports Series palette and giving Spider customers a choice of 20 colours in total. The new hues dramatically showcase the complex forms of the aluminium bodywork and unique-in-class dihedral doors, particularly when combined for added visual impact with an optional Dark Palladium grey contrast finish on the roof, windscreen pillars and rear buttresses. An all-new, 10-spoke lightweight forged alloy wheel design (19-inch front, 20-inch rear) has been crafted as an option for the new 570S Spider. For further differentiation, a new brake caliper colour, Liquid Black, is also available. 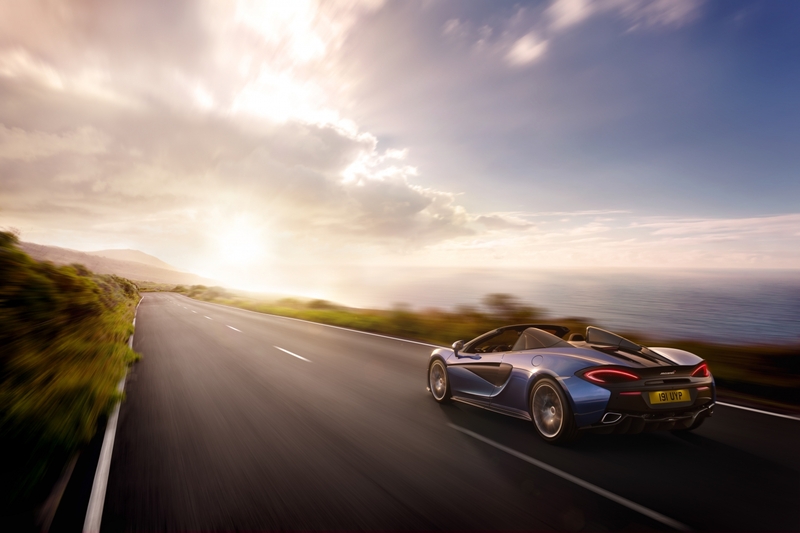 The new McLaren 570S Spider will make its public debut on 29th June at the Goodwood Festival of Speed, West Sussex, UK and the first cars are scheduled to be delivered to customers in August.